The threats to birds are many and the trajectory for some of our most beloved Michigan species is not positive. Nearly everything that threatens our birds is human-driven: urbanization; invasive species; windows; lights; unsustainable consumerism; and, perhaps worst of all, nature deficit disorder. These human-driven threats have human-driven solutions. No matter your background, interests, or experience, there is an action you can take to make the world better for birds. Your action may inspire a friend, a family member, or your neighbor to take action as well. We at Michigan Audubon invite you to make 2017 a year for conservation action – let’s each make a pledge for birds! You won’t be alone in your conservation-minded pursuits; we’ll help you. We’ve put together 5 broad categories of pledges for you to explore, each containing a variety of actions for every type of bird aficionado. Get inspired by our suggestions or feel free to customize your own pledge for birds. The greatest threat to birds is habitat loss. While we often look to preserves and protected lands to support wildlife, there are millions of acres with great potential that we consistently overlook—urban spaces. Backyards, curbsides, ditches, urban parks, and suburban lawns are bursting with opportunity; but we must terminate our love affair with turf. Put on your habitat-tinted glasses and re-imagine that “hellstrip” between the curb and sidewalk. Replace that swath of manicured lawn with a strip of sunset orange butterfly milkweed, swaying little bluestem grass, and delicate foxglove. Think of that ditch you awkwardly mow (when it isn’t sopping wet) and imagine dark purple asters, pink swamp milkweed, or a burst of red cardinal flower. Imagine your workplace, church, or school—is there a place where butterflies flit and birds find refuge? Explore the links below for a variety of resources to help you create better habitat in 2017! While not all of the gardens are native or Michigan-specific, there are practical tips on transforming turf into gardens, maintaining different types of gardens, and photographs for design inspiration. If you’ve ever wondered what the big deal is about native plants, this book is an essential introduction. Tallamy gives real-world examples of the role native plants play in natural and landscaped settings. Once you read this book, you’ll never plant another Burning Bush again. Garden Revolution shows how an ecological approach to planting can lead to beautiful gardens that buck much of conventional gardening’s counter-productive, time-consuming practices. Instead of picking the wrong plant and then constantly tilling, weeding, irrigating, and fertilizing, Weaner advocates for choosing plants that are adapted to the soil and climate of a specific site and letting them naturally evolve over time. While there isn’t an emphasis on Michigan plants or even on native plants, there are practical tips on gardening in the spaces between sidewalks and curbs, including information on navigating city ordinances and other unexpected pitfalls. What many consider a must-have for native gardeners, Landscaping with Native Plants of Michigan answers a wide range of practical gardening questions, gives species lists for every growing condition, and provides a full appendix of plant species accounts complete with beautiful photographs sure to inspire. Many gardeners today want a home landscape that nourishes and fosters wildlife. But they also want beauty, a space for the kids to play, privacy, and maybe even a vegetable patch. Sure, it’s a tall order, but The Living Landscape shows how to do it. An inspiring call to action dedicated to the idea of a new nature—a hybrid of both the wild and the cultivated—that can flourish in our cities and suburbs. Midwest Invasive Plant Network – Provides information on invasive plant identification and tested control methods. Midwest Invasive Species Information Network – Great resource for mapping invasive species observations via the website and a mobile app. This site also provides invasive plant identification training modules. There are numerous places to volunteer and make a big impact towards providing and maintaining healthy landscapes. Here are just a few suggestions. We each have experience, knowledge, and passion to share with others. At a time when nature deficit disorder is a concern for both children and adults, it is more important than ever to share our appreciation for nature and engage others to explore the natural world with us. If you have children, grandchildren, nieces or nephews, or other young people in your life, introduce them to birds. Whether through coloring books, stories, feeder watching, or nature walks, there are many ways to engage young people in birding. Even if you aren’t an expert birder, just sharing your appreciation for nature with others is incredibly valuable. Organize casual bird walks at a local park, start a coffee or book club for bird and nature lovers, gather a volunteer group to adopt a native garden or nest box trail, or offer your skills as a writer, illustrator, orator, or filmmaker to a nonprofit. We each can make a unique contribution to bird conservation. Explore the links below for helpful tips regarding how to share your knowledge and time for bird conservation. Joining a Garden Club by National Garden Clubs, Inc.
North Huron Birding Trail Development Guide. Email birds@michiganaudubon.org for a copy. Citizen science has opened up a world of science and discovery to millions of observant people. Our curious nature drives us to take note of which birds we are seeing, where, when, and how many. These local observations piece together to form a full, landscape-wide picture of the status of bird species. The opportunities to contribute to research and conservation by gathering data from the world around us are endless. No matter the season, location, age or experience level, there is a type of citizen science project fit for everyone. Researchers have utilized results from these citizen science projects to detect long-term population declines, range expansions, migration shifts, and much more. 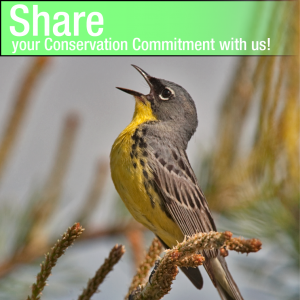 Your contributions are valuable for bird conservation locally, regionally, and worldwide. Explore the links below to learn about a variety worthy citizen science efforts. As consumers, we make a statement with our wallets. Where we choose to invest money reflects our personal values. We focus many of our conservation efforts on issues here in Michigan, mostly regarding breeding birds, but many of our actions as consumers impact migratory birds on the wintering grounds or birds that we may never interact with, but also need our help. Shade-grown coffee plantations support a significantly greater diversity and number of birds compared with aggressive sun-grown plantations. Pelagic species are consuming bits of algae-scented plastic and filling the bellies of their young with indigestible refuse. Making well-informed purchasing decisions sends a clear economic message – birders are willing to invest in sustainable, bird-friendly products and markets. Explore the links below for suggestions about choosing bird- and eco-friendly products. We live in an ever-changing world where many of the governing bodies are out of touch with nature and the needs of the environment. It is our responsibility to inform decision makers that we as constituents value birds, nature, and the environment and their protection is important to us. The birds cannot write to their congressmen and women; we must speak up for them. There is no need to grab a sign and picket, but it’s important to be informed about the issues at hand. Get involved with policy at the local, state, and federal level and be an informed voter or write letters, op-eds, or statements to present at planning commission meetings. Give a voice to birds in a respectful, engaging way to be a successful advocate for birds. Explore the links below for actions you can take to be a voice for birds.